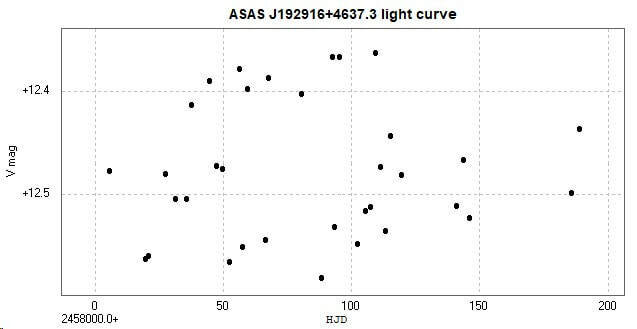 Light curve and phase diagram of the EW type eclipsing binary ASAS J192916+4637.3. These were constructed from photometry of 34 images taken with the Open University COAST telescope (a 14 inch / 35 cm Schmidt-Cassegrain) between 2017 September 8 and 2018 March 11, using a V filter. 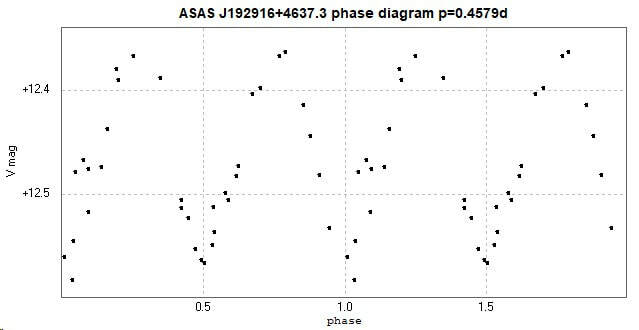 The catalogue period for this system is 0.4579485d (AAVSO VSX). There is interest in this system as it is a potential luminous red nova candidate (for references see op cit). [Accessed 2018 November 1].